One of the more interesting and rewarding aspects of astronomy and space exploration is seeing science fiction become science fact. While we are still many years away from colonizing the Solar System or reaching the nearest stars (if we ever do), there are still many rewarding discoveries being made that are fulfilling the fevered dreams of science fiction fans. For instance, using the Dharma Planet Survey, an international team of scientists recently discovered a super-Earth orbiting a star just 16 light-years away. This super-Earth is not only the closest planet of its kind to the Solar System, it also happens to be located in the same star system as the fictional planet Vulcan from the Star Trek universe. In the past few decades, thousands of extra-solar planets have been discovered within our galaxy. As of July 28th, 2018, a total of 3,374 extra-solar planets have been confirmed in 2,814 planetary systems. While the majority of these planets have been gas giants, an increasing number have been terrestrial (i.e. rocky) in nature and were found to be orbiting within their stars’ respective habitable zones (HZ). However, as the case of the Solar System shows, HZs do not necessary mean a planet can support life. Even though Venus and Mars are at the inner and the outer edge of the Sun’s HZ (respectively), neither is capable of supporting life on its surface. And with more potentially-habitable planets being discovered all the time, a new study suggests that it might be time to refine our definition of habitable zones. The study, titled “A more comprehensive habitable zone for finding life on other planets“, recently appeared online. The study was conducted by Dr. Ramses M. Ramirez, a research scientist with the Earth-Life Science Institute at the Tokyo Institute of Technology. For years, Dr. Ramirez has been involved in the study of potentially-habitable worlds and built climate models to assess the processes that make planets habitable. “The most popular incarnation of the HZ is the classical HZ. This classical definition assumes that the most important greenhouse gases in potentially habitable planets are carbon dioxide and water vapor. It also assumes that habitability on such planets is sustained by the carbonate-silicate cycle, as is the case for the Earth. On our planet, the carbonate-silicate cycle is powered by plate tectonics. This is what can be referred to as the “low-hanging fruit” approach, where scientists have looked for signs of habitability based on what we as humans are most familiar with. Given that the only example we have of habitability is planet Earth, exoplanet studies have been focused on finding planets that are “Earth-like” in composition (i.e. rocky), orbit, and size. However, in recent years this definition has come to be challenged by newer studies. As exoplanet research has moved away from merely detecting and confirming the existence of bodies around other stars and moved into characterization, newer formulations of HZs have emerged that have attempted to capture the diversity of potentially-habitable worlds. One such study was conducted by Dr. Ramirez and Lisa Kaltenegger, an associate professor with the Carl Sagan Institute at Cornell University. According to a paper they produced in 2017, which appeared in the Astrophysical Journal Letters, exoplanet-hunters could find planets that would one day become habitable based on the presence of volcanic activity – which would be discernible through the presence of hydrogen gas (H2) in their atmospheres. This theory is a natural extension of the search for “Earth-like” conditions, which considers that Earth’s atmosphere was not always as it is today. Basically, planetary scientists theorize that billions of years ago, Earth’s early atmosphere had an abundant supply of hydrogen gas (H2) due to volcanic outgassing and interaction between hydrogen and nitrogen molecules in this atmosphere is what kept the Earth warm long enough for life to develop. In Earth’s case, this hydrogen eventually escaped into space, which is believed to be the case for all terrestrial planets. However, on a planet where there is sufficient levels of volcanic activity, the presence of hydrogen gas in the atmosphere could be maintained, thus allowing for a greenhouse effect that would keep their surfaces warm. In this respect, the presence of hydrogen gas in a planet’s atmosphere could extend a star’s HZ. “[I]t has been shown that M-dwarfs (really cool stars) are so bright and hot when they first form that they can desiccate any young planets that are later determined to be in the classical HZ. This underscores the point that just because a planet is currently located in the habitable zone, it doesn’t mean that it is actually habitable (let alone inhabited). We should be able to watch out for these cases. Finally, there is the issue of what kinds of star system astronomers have been observing in the hunt for exoplanets. Whereas many surveys have examined G-type yellow dwarf star (which is what our Sun is), much research has been focused on M-type (red dwarf) stars of late because of their longevity and the fact that they believed to be the most likely place to find rocky planets that orbit within their stars’ HZs. In the end, this study shows that the classical HZ is not the only tool that can be used to asses the possibility of extra-terrestrial life. As such, Ramirez recommends that in the future, astronomers and exoplanet-hunters should supplement the classical HZ with the additional considerations raised by these newer formulations. In so doing, they just may be able to maximize their chances for finding life someday. Shortly after Einstein published his Theory of General Relativity in 1915, physicists began to speculate about the existence of black holes. These regions of space-time from which nothing (not even light) can escape are what naturally occur at the end of most massive stars’ life cycle. While black holes are generally thought to be voracious eaters, some physicists have wondered if they could also support planetary systems of their own. Looking to address this question, Dr. Sean Raymond – an American physicist currently at the University of Bourdeaux – created a hypothetical planetary system where a black hole lies at the center. Based on a series of gravitational calculations, he determined that a black hole would be capable of keeping nine individual Suns in a stable orbit around it, which would be able to support 550 planets within a habitable zone. He named this hypothetical system “The Black Hole Ultimate Solar System“, which consists of a non-spinning black hole that is 1 million times as massive as the Sun. That is roughly one-quarter the mass of Sagittarius A*, the super-massive black hole (SMBH) that resides at the center of the Milky Way Galaxy (which contains 4.31 million Solar Masses). Another major advantage of having a black hole at the center of a system is that it shrinks what is known as the “Hill radius” (aka. Hill sphere, or Roche sphere). This is essentially the region around a planet where its gravity is dominant over that of the star it orbits, and can therefore attract satellites. According to Raymond, a planet’s Hill radius would be 100 times smaller around a million-sun black hole than around the Sun. This is what allows for many planets to be placed with the system’s habitable zone. Based on the Earth’s Hill radius, Raymond estimates that about six Earth-mass planets could fit into stable orbits within the same zone around our Sun. This is based on the fact that Earth-mass planets could be spaced roughly 0.1 AU from each other and maintain a stable orbit. Given that the Sun’s habitable zone corresponds roughly to the distances between Venus and Mars – which are 0.3 and 0.5 AU away, respectively – this means there is 0.8 AUs of room to work with. However, around a black hole with 1 million Solar Masses, the closest neighboring planet could be just 1/1000th (0.001) of an AU away and still have a stable orbit. Doing the math, this means that roughly 550 Earths could fit in the same region orbiting the black hole and its nine Suns. There is one minor drawback to this whole scenario, which is that the black hole would have to remain at its current mass. If it were to become any larger, it would cause the Hill radii of its 550 planets to shrink down further and further. Once the Hill radius got down to the point where it was the same size as any of the Earth-mass planets, the black hole would begin to tear them apart. But at 1 million Solar masses, the black hole is capable of supporting a massive system of planets comfortably. “With our million-Sun black hole the Earth’s Hill radius (on its current orbit) would already be down to the limit, just a bit more than twice Earth’s actual radius,” he says. Lastly, Raymond considers the implications that living in such a system would have. For one, a year on any planet within the system’s habitable zone would be much shorter, owing to the fact their orbital periods would be much faster. Basically, a year would last roughly 1.6 days for planets at the inner edge of the habitable zone and 4.6 days for planets at the outer edge of the habitable zone. He also indicates that conjunctions would occur almost once per orbit, which would mean that every few days, there would be no shortage of giant objects passing across the sky. And of course, there would be the Sun’s themselves. Recall that scene in Star Wars where a young Luke Skywalker is watching two suns set in the desert? Well, it would a little like that, except way more cool! According to Raymond’s calculations, the nine Suns would complete an orbit around the black hole every three hours. Every twenty minutes, one of these Suns would pass behind the black hole, taking just 49 seconds to do so. At this point, gravitational lensing would occur, where the black hole would focus the Sun’s light toward the planet and distort the apparent shape of the Sun. To illustrate what this would look like, he provides an animation (shown above) created by @GregroxMun – a planet modeller who develops space graphics for Kerbal and other programs – using Space Engine. While such a system may never occur in nature, it is interesting to know that such a system would be physically possible. And who knows? Perhaps a sufficiently advanced species, with the ability to tow stars and planets from one system and place them in orbit around a black hole, could fashion this Ultimate Solar System. Something for SETI researchers to be on the lookout for, perhaps? This hypothetical exercise was the second installment in two-part series by Raymond, titled “Black holes and planets”. In the first installment, “The Black Hole Solar System“, Raymond considered what it would be like if our system orbited around a black hole-Sun binary. As he indicated, the consequences for Earth and the other Solar planets would be interesting, to say the least! Raymond also recently expanded on the Ultimate Solar System by proposing The Million Earth Solar System. Check them all out at his website, PlanetPlanet.net. At distance of just 4.367 light years, the triple star system of Alpha Centauri (Alpha Centauri A+B and Proxima Centauri) is the closest star system to our own. 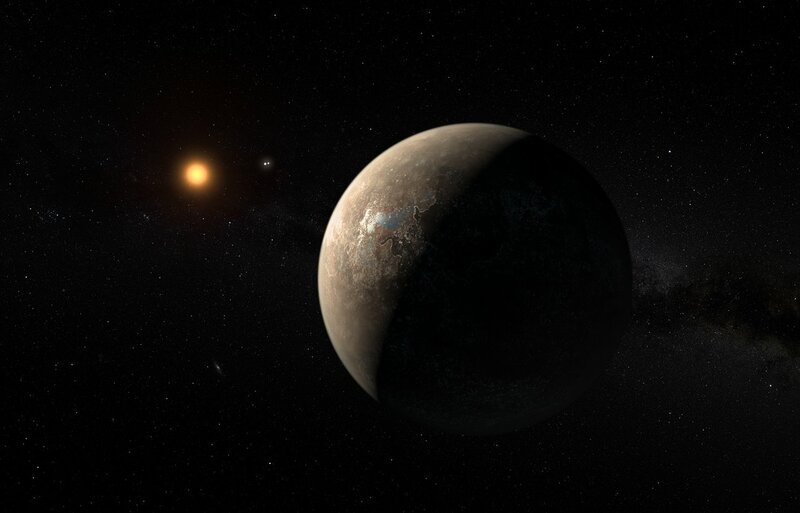 In 2016, researchers from the European Southern Observatory announced the discovery of Proxima b, a rocky planet located within the star’s habitable zone and the closest exoplanet to our Solar System. However, whether or not Alpha Centauri has any potentially habitable planets remains a mystery. Between 2012 and 2015, three possible candidates were announced in this system, but follow-up studies cast doubt on their existence. Looking to resolve this mystery, Tom Ayres – a senior research associate and Fellow at the University of Colorado Boulder’s Center for Astrophysics and Space Astronomy – conducted a study of Alpha Centauri based on over a decade’s worth of observations, with encouraging results! The results of this study were presented at the 232rd meeting of the American Astronomical Society, which took place in Denver, Colorado, from June 3rd to June 7th. The study was based on ten years worth of monitoring of Alpha Centauri, which was provided the Chandra X-ray Observatory. This data indicated that any planets that orbit Alpha Centauri A and B are not likely to be bombarded by large amounts of X-ray radiation. This is good news as far as Alpha Centauri’s potential habitability goes since X-rays and related Space Weather effects are harmful to unprotected life. Not only can high doses of radiation be lethal to living creatures, they can also strip away planetary atmospheres. According to data provided by the Mars Atmosphere and Volatile EvolutioN (MAVEN) orbiter, this is precisely what happened to Mars between 4.2 and 3.7 billion years ago. The stars in the Alpha Centauri system (A and B) are quite similar to our Sun and orbit relatively close to each other. Alpha Centauri A, a G2 V (yellow dwarf) star, is the most Sun-like of the two, being 1.1 times the mass and 1.519 times the luminosity of the Sun. 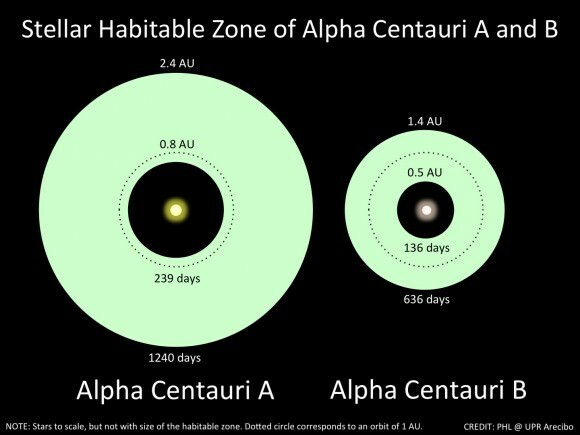 Alpha Centauri B is somewhat smaller and cooler, at 0.907 times the Sun’s mass and 0.445 times its visual luminosity. As such, the odds that the system could support an Earth-like planet are pretty good, especially around Alpha Centauri A. According to the Chandra data, the prospects for life (based on X-ray bombardment) are actually better for any planet orbiting Alpha Centauri A than for the Sun, and Alpha Centauri B is only slightly worse. This is certainly good news for those who are hoping that a potentially habitable exoplanet is found in close proximity to the Solar System. Meanwhile, astronomers continue to search for exoplanets around Alpha Centauri A and B, but without success. The problem with this system is the orbit of the pair, which has drawn the two bright stars close together in the sky over the past decade. To help determine if Alpha Centauri was hospitable to life, astronomers began conducting a long-term observation campaign with Chandra in 2005. As the only X-ray observatory capable of resolving Alpha Centauri A and B during its current close orbital approach, Chandra observed these two main stars every six months for the past thirteen years. These long-term measurements captured a full cycle of increases and decreases in X-ray activity, in much the same way that the Sun has an 11-year sunspot cycle. What these observations showed was that any planet orbiting within the habitable zone of A would receive (on average) a lower dose of X-rays compared to similar planets around the Sun. For planets orbiting withing the habitable zone of B, the X-ray dose they received would be about five times higher. 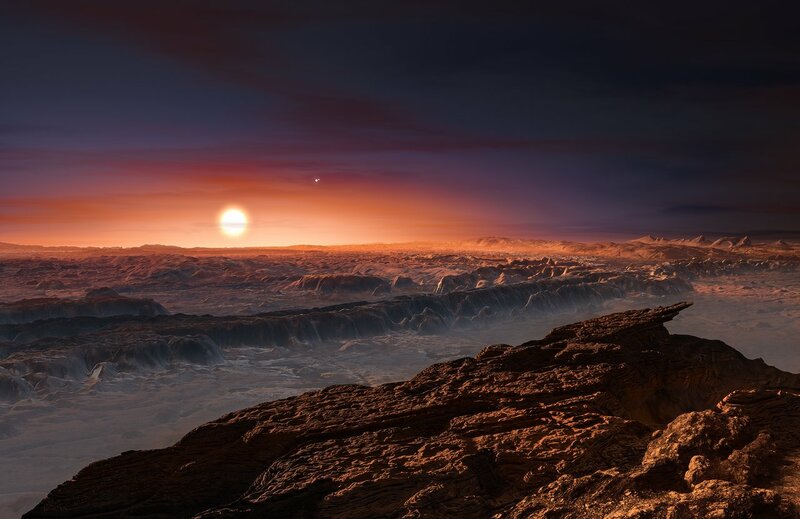 Meanwhile, planets orbiting within Proxima Centauri’s habitable zone would get an average of 500 times more X-rays, and 50,000 times more during a big flare. In addition to providing encouraging hints about Alpha Centauri’s possible habitability, the X-ray observations provided by Chandra could also go a long way towards informing astronomers about our Sun’s X-ray activity. Understanding this is key to learning more about space weather and the threat they can pose to human infrastructure, as well as other technologically-advanced civilizations. In the meantime, astronomers continue to search for exoplanets around Alpha Centauri A and B. Knowing that they have a good chance of supporting life will certainly make any future exploration of this system (like Project Starshot) all the more lucrative!